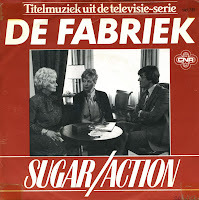 The Dutch broadcaster TROS showed the weekly television drama 'De Fabriek' ('The factory') in 1981 and 1982. The sugar factory of the Dutch company CSM was one of the locations where the series was filmed. It became a television hit, with several million viewers every week. One of the assets of the series was the theme tune, composed by Ruud Bos. Entitled 'Sugar' on this single, it is familiar even to some people who never even saw the series. Still, the single was never a hit in the Netherlands. I still consider this single a rare find.